Located basically of a flattish plane, London of the old days could not boast of many high-rise places to cast a longing glance over what is yours for taking. Here is the assortment of the distinguished few venues that are still operative today and offer great views over London boroughs. 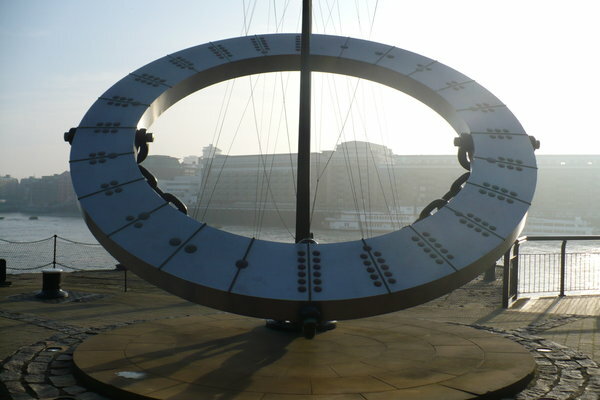 The Monument stands on the piazza between Fish Street Hill and Monument Street in the place where the Great Fire of 1666 started. The story is a sad requiem of fire safety. The fire began in a baker’s house in Pudding Lane on Sunday 2nd September 1666 and finally extinguished on Wednesday 5th September, after destroying the greater part of the City. Visitors often ask how much damage was made. Although there was officially little loss of life, the fire brought all activity to a halt, having consumed or severely damaged thousands of houses, hundreds of streets, the City’s gates, public buildings, churches and St. Paul’s Cathedral. The only buildings to survive in part were those built of stone, like St. Paul’s and the Guildhall. The Doric column was designed by Sir Christopher Wren and Dr Robert Hooke and completed in 1677. THere is gilded urn of fire on top of the edifice made of Portland stone. 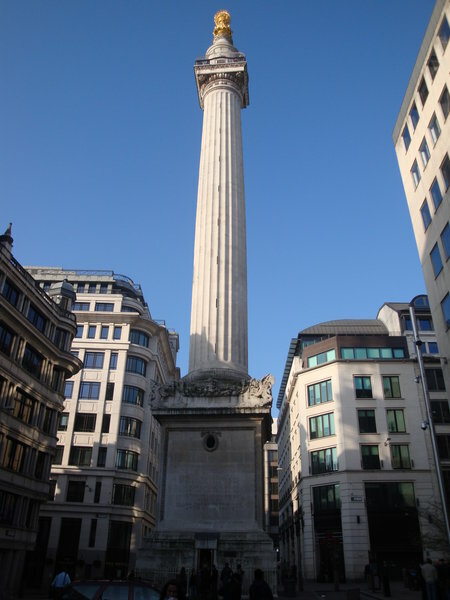 In accordance with Wren’s original intention, was at first used as a place for certain experiments of the Royal Society, but vibrations caused by ceaseless traffic proved too great for the success of these experiments and they were discontinued; thereafter the Monument became a place of historic interest, unique of its kind, providing visitors with an opportunity to look across London in all directions from a height of about 160 feet, being the level of the public gallery. Three sides of the base have Latin inscriptions, one is devoted to King Charles II actions taken after the fire. One describes how the Monument was started and brought to perfection, and under which mayors. Inscriptions on the north side describe how the fire started, how much damage it caused, and how it was eventually extinguished. 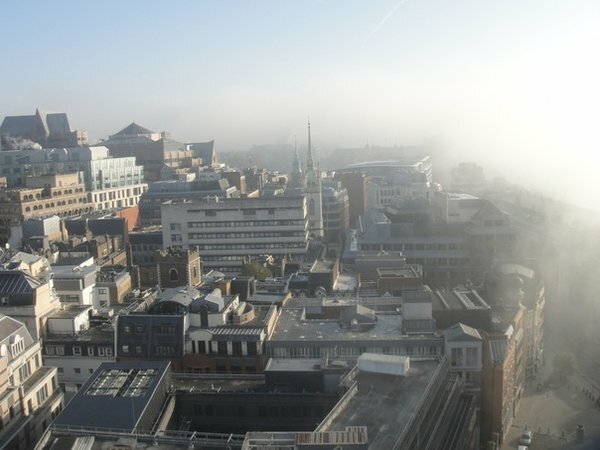 It is actually a 2010 photo, on a misty morning with the fog creeping over from the river, the Tower Bridge is still there under this white blanket in the right-hand upper corner. Price tag: £5, but you can also have a combo ticket for £12 with the Tower Bridge. Finally, something free of charge! The Blavatnik building of Tate Modern offers awe-inspiring 360ᵒ views of the London skyline, from high above the River Thames, St Paul’s Cathedral, and as far as Canary Wharf and Wembley Stadium. Access is free, and you can use the dedicated lift from Level 0. The chance to hop on the lift from the 1st and upper floors is very slim though, but you can always take the stairs, it is just 10 floors, if you get hungry on the way up, there is a restaurant on the 9th floor. The 'goldfish-bowl' experience of the luxury housing dwellers. Five Neo Bankside residents are launching legal action claiming platform has turned their homes into ‘goldfish bowl’. 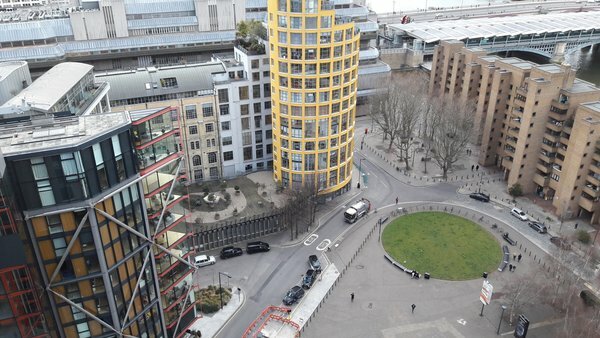 Residents living in luxury flats neighbouring the Tate Modern have given their backing to a lawsuit against the gallery for building a public platform that looks directly into some of their homes. 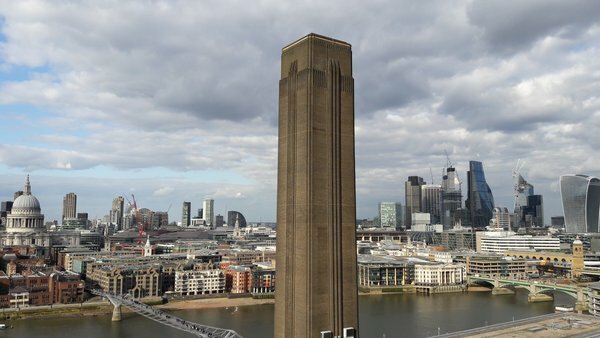 That is why every single pillar on the observation platform asks the visitors to respect Tate’s neighbours. The Dolphin and the Mermaid fountain is on the other side of the bridge from the Tower of London. Unfortunately, it does not in winter. is an unmistakable icon of London, seen on many a postcard sold in shops nationwide. Tower Bridge is a suspension bridge and a world heritage site measuring 265m (801 feet) long and 65m (264 feet) high and provides a roadway across the Thames for over 40,000 people both on foot and wheels. The bridge, designed by city architect Horace Jones in collaboration with John Wolfe Barry, was completed in 1894. Five contractors and nearly 450 workers were involved. It took 11,000 tons of steel to build the framework. 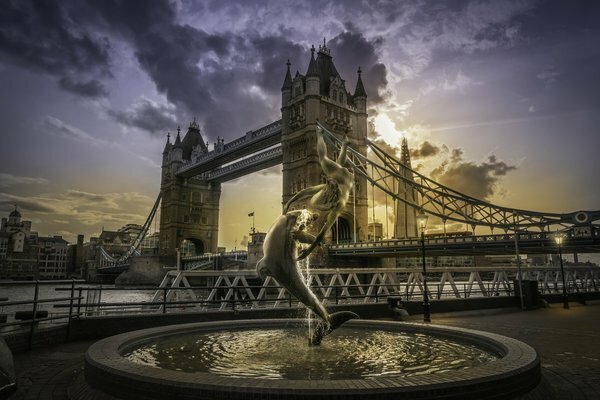 It’s free to walk across the bridge and to witness its opening and closing, but you will need to buy a ticket for the Tower Bridge Exhibition. You can visit Tower Bridge any season any time, but some try their best to visit Tower Bridge when the bridge is lifted for a boat to pass. As a result, it can get pretty crowded while visiting during this event. Thankfully, the Tower Bridge Experience has provided an app which will allow you to see what this event looks like even if you visit at the wrong time. With their Raise Tower Bridge app, you can point your phone at the glass floor and simulate the experience of seeing the bridge lift up underneath. The east walkway is considered to provide more spectacular views of the city. Each deck is more than 30 meters wide and can be opened to an angle of 83 degrees. When opened the bridge has a clearance of almost 45 meters. It used to open almost fifty times a day but nowadays it is only raised about one thousand times a year. Bridge lifts are pre-scheduled. 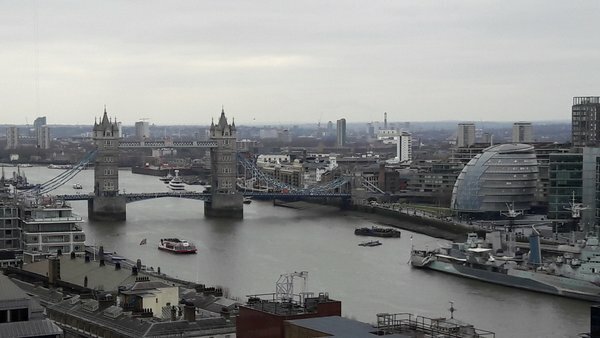 The Tower Bridge offers wonderful views of London 42m (130 feet) above the river as well as the opportunity to learn all about the bridge itself and how it works. The Exhibition also includes photos of over 20 great bridges of the world. Admission is included for free with the purchase of the London Pass or the Explorer Pass. You can also buy a combo with the Monument. There is no cost to cross the bridge on the roadway. The road is public. However, you need to pay to enter the Tower Bridge Experience. Once you are done with tickling your nerves, get down to the Engine Rooms, the permanent exhibition of the unsung heroes who kept an icon in motion. 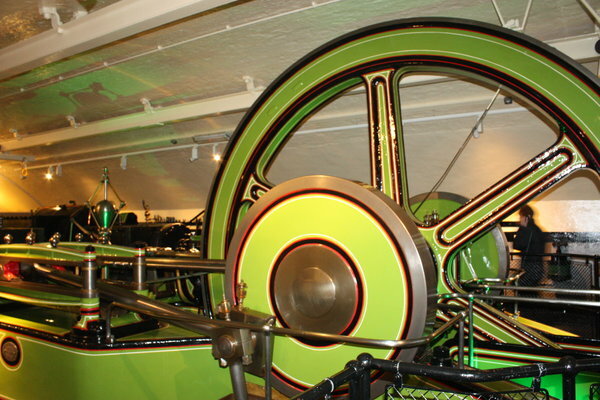 There original steam engines, coal burners and accumulators that once powered the raising of Tower Bridge, you can read the fascinating stories of cooks, coal stokers and engineers. Just in case you want to know what the time is and can use this edifice. It is actually near the Dolphin and the Mermaid Fountain. The current building of St. Paul’s Cathedral is the fourth erected on the site where a Roman temple to Diana may once have stood. 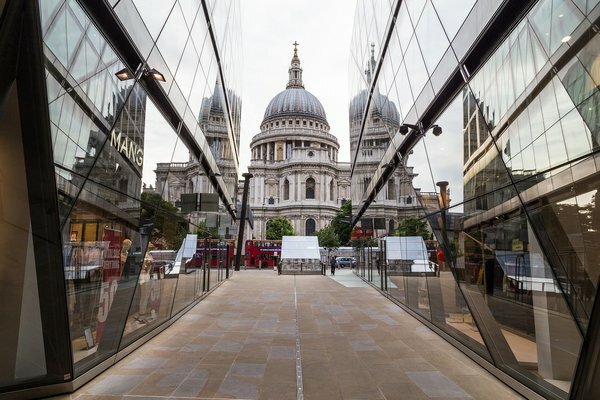 The temple gave way to the first Christian cathedral which was dedicated to St. Paul in AD 604, during the rule of King Aethelberht I.
St. Paul’s that we see today dates back to the late 17th century, it was designed in the English Baroque style by Sir Christopher Wren. Its construction, completed in Wren's lifetime, was part of a major rebuilding programme in the City after the Great Fire of London. St. Paul's dome, framed by the spires of Wren's City churches, has dominated the skyline for over 300 years. At 111m (365ft) high, it was the tallest building in London from 1710 to 1967. The dome is among the highest in the world. St Paul's is the second-largest church building in the area in the United Kingdom after Liverpool Cathedral. If your budget is tight, you can get on top of the nearby business centre for free and get almost the same views. Actually, it is a good roof to have a closer look at the Cathedral itself. St. Paul’s famous dome is composed of three shells: an outer dome, a concealed brick cone for structural support, and an inner dome. The cross atop its outer dome stands nearly 366 feet (112 metres) above ground level (some 356 feet [109 metres] above the main floor of the cathedral). Below the cross is an 850-ton lantern section and the outer, lead-encased dome, both of which are supported by the brick cone. 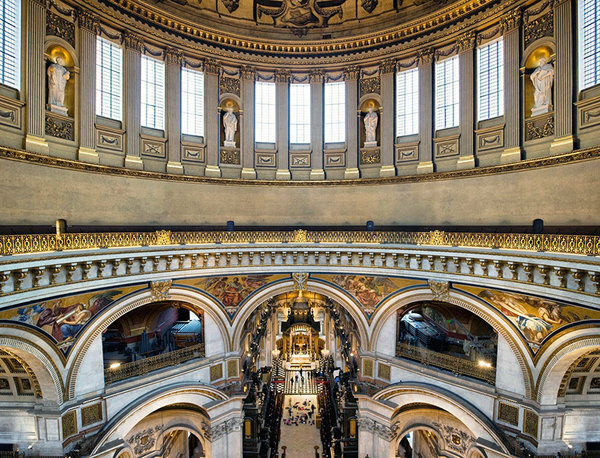 At the base of the lantern (the apex of the outer dome) is the famous Golden Gallery, which offers panoramas of London some 530 steps (and some 280 feet [85 metres]) above the ground. Farther down, at a point just below the brick cone, is the Stone Gallery, another popular viewing spot. While you are up there, drop to the Whispering Gallery. If you whisper against the wall at any point, you can be heard by anyone with their ear against the wall at any other point in the gallery. Discover this amazing acoustic feature! The tourist entry fee at the door is £18 for adults (March 2017, cheaper online), but no charge is made to worshippers. Actually, you are not allowed to take any photos inside, so this one is the courtesy of google pictures. 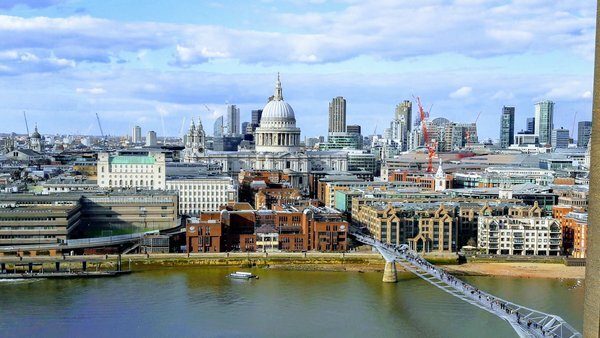 There are definitely more historic venues to see London from, but these offer the most iconic views. Let us know what your favourite spots are.